For me, autumn means crunchy leaves, crisp wind during a run, and apple picking. Though I think we went a little late in the season this year since most of the apples had already fallen from the trees, Todd and I still had a great time apple picking with my parents at Barton Orchard in Poughquag, New York. Row upon row of apple tree promised to fill our bag, with varieties like Rome, Fuji, Macintosh, Ida Red, Golden Delicious, Granny Smith, and more. I also really wanted to venture into the five-acre corn maze, but unfortunately the day turned rainy and so we decided to just call it a day and buy some apple salsa, cherry apple butter, and both a berry pie and a pumpkin pie. I love running outside in the summer, with the heat bearing down like thick molasses and sweat making my skin shine. There’s something about a blistering sun overhead and the smell of sunblock slathered all over my face that says freedom like nothing else. I also like winter running, bundled in extra socks, a hoodie, ear warmers, and mittens, when I sweat through all my layers as though it were summer again. Running during spring or autumn, especially autumn, is a much greater struggle. Some pretty big life developments are in the works right now that I truly hope to get the chance to share with you soon. For now, because I don’t have a ton of time but don’t want to forget about posting on this blog, I thought I would do a short, fun photo post to give you a glimpse into my weekend. And I’m already looking forward to the upcoming weekend because I’m going apple picking! Hopefully that will lead to some great recipes I can share. I often myself so obsessed with an author that I hungrily read every work that author has written, looking for similarities and differences. I read Ernest Hemingway’s books in the order he wrote them. With others, like Ted Conover and Tim O’Brien, I started in the middle and branched out. Others I’m still working on: Haruki Murakami, Sarah Addison Allen, and Margaret Atwood, to name a few. 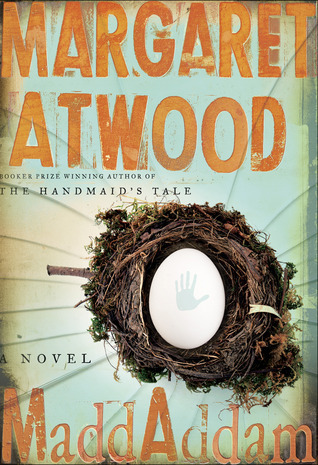 Which brings me to MaddAddam, the last installment in Atwood’s postapocalyptic trilogy of the same name. I’ve long considered the first book of the series, Oryx and Crake, as one of my top five favorite books of all time. It tosses the reader into a confusing world of genetic manipulation and dystopian horror, yet still manages to tell the poignant, heartbreaking tale of one of the last humans left on earth.